Are Alcohol Calories Ruining Your Diet? Coconut water was all the range last year and I’ve tried and tested a fair few of them (see post). Coconut water takes a bit of getting used to and the taste isn’t for everyone. However, I recently discovered a different type of coconut drink by the brand Bai which is a blend of coconut water and sweetened with natural sources and natural flavours. Before purchasing a bottle, I checked the ingredients to make sure there were no nasties in there, and was pleasantly surprised to see an ingredient which research has recently shown helps support a healthy brain. It also has just 5 calories per 530ml bottle! Here’s a bit of information about the brand - drinkbai website. 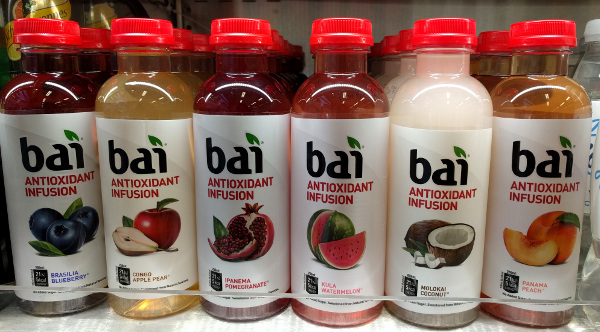 ‘Bai’ is the Mandarin Chinese word for ‘pure’. Bai was founded by American entrepreneur and coffee industry pioneer Ben Weiss and launched in Princeton, New Jersey, USA in August 2009. The company expanded into USA national distribution in 2014 and launched in the UK in 2017. Varieties include: Brasilia Blueberry, Congo Apple Pear, Ipanema Pomegranate, Kula Watermelon, Panama Peach, and Molokai Coconut. I wasn’t expecting too much from this drink with regards to taste. However, what a lovely surprise. It has an amazingly strong coconut flavour. Strangely it tastes even more coconuty than pure coconut water. It reminded me of a coconut yogurt I used to eat years ago. Absolutely delicious. I find most flavoured waters a bit insipid, but this was full flavoured and totally thirst quenching. Other bonus points for Bai are it’s antioxidant properties. It is marketed as an anti oxidant drink and has extra Vitamin E, Vitamin C, white tea extract and coffee fruit. I’ve been learning about coffee fruit. Coffee fruit is the fruit that holds coffee beans. This fruit contains loads of antioxidants. It’s also a powerful source of BDNF (brain derived neurotrophic factor)! A recent talk by Dr David Perlmutter on Alzheimer’s Disease explained the powerful benefits of coffee fruit, including reducing the rate of cognitive decline. Unfortunately Bai only has 1% coffee fruit so I don’t expect it will make a whole lot of difference to brain power. But every little bit helps! The only negative aspect of Bai drinks is the price - £2.49 per bottle which will probably stop me purchasing it on a regular basis. I usually take my own glass bottle of lemon water around with me, but if I’m caught out and need to buy a drink, I’d hope to be able to find this sold more widely in the shops. 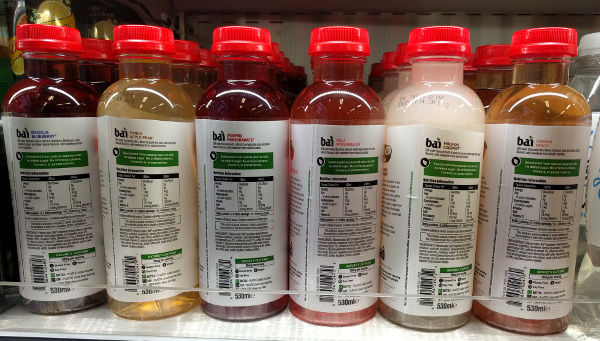 Right now Bai is sold in branches of Boots, and Ocado online and Amazon. The bottle is recyclable and is PBA free (never hot filled). Nutrition per 100ml: 2 calories, 0g fat, 0g saturated fat, 2.2g carbohydrates, 0.2g sugars, 0g protein, 73mg salt, 61.2mg potassium, 1.2mg Vitamin E. 30g caffeine per 250ml serving. Vegan, gluten free, soy free, contains electrolytes. Ingredients: Filtered water, Bai® Proprietary Blend (Flavour Enhancer: Erythritol, Sweetener: Steviol Glycosides), Concentrated Coconut Water 6%, Coffeefruit Extract 1%, White Tea Extract, Vitamin E, Natural Coconut Flavouring with other Natural Flavourings, Sea Salt, Acids (Citric Acid, Malic Acid), Acidity Regulator (Tripotassium Citrate).